On the back of several major natural disasters, Facebook has created a new Crisis Response hub for all users. This is a drastic upgrade on the former Safety Check feature Facebook Helps You Help Others During a Crisis Facebook Helps You Help Others During a Crisis Facebook is putting its huge database to good use with a new effort called Community Help. This, as you may have gleaned from the headline, helps you help others during a crisis. Read More many people have used over the years in extreme events. 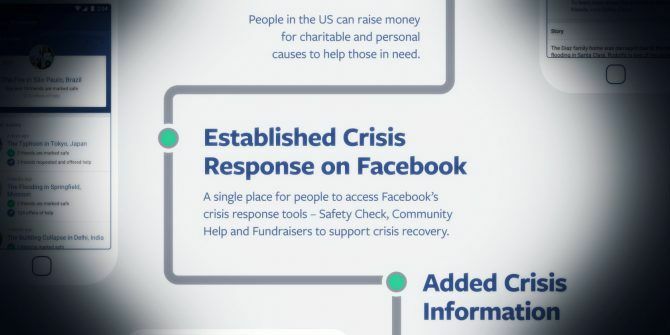 The Crisis Response hub is the evolution of several crisis help features in existence across Facebook. In addition, the hub will feature a mixture of public Facebook posts, up-to-date news articles, photos, and videos of the crisis to keep people informed, and hopefully weed out the fake news How to Quickly Avoid Fake News During an Unfolding Crisis How to Quickly Avoid Fake News During an Unfolding Crisis Next time there's a crisis, don't fall for any hype. Cut through the social scams and the lies to find the truth with these tips. Read More . Love it or hate it, Facebook has become a focal point for human activity, especially during times of crisis. Its unbridled reach around the globe means it is perfectly poised as a crisis response tool. This role has been exemplified during recent major events. 911 can only cope with so many calls, and have limited response rates, too. During the recent Hurricane Harvey and Irma disasters, 911 responders were quickly overwhelmed. However, some people took to Facebook (and Twitter) to ask for help — with some amazing, heart-warming responses the result. For instance, Austin Seth saw the cries for help, and travelled with his boat for over an hour to help those stranded in their homes. Facebook rightfully takes criticism for some of its business practices, but this is one occasion where its overreaching arms are exactly what the world needs. The Crisis Response hub is currently rolling out to users around the world, and should be accessible from your account within the next few days. Is the centralized Crisis Response hub a worthwhile Facebook feature? Or is it Facebook trying to grab more power and influence in our lives? Let us know your thoughts below!